past year, and they aim to educate business leaders on collaborative overload, the necessity of managing algorithms, design thinking, negotiating across cultures, finding career success in a world of automation, and much more. The negative effects of constant collaboration. Collaborative work has increased dramatically, and while there are clear benefits to this level of teamwork, too much collaboration can have its downsides. Employees who engage in an overabundance of collaborative activities can cause workflow bottlenecks and eventually burn out. The importance of human oversight when using algorithms. Managers who make business predictions often rely on algorithms to identify subtle patterns, but computer algorithms have their limitations. Algorithms are most effective when managers are explicit about their goals and concerns, minimize myopia, and choose the right inputs. The intricacies of doing business abroad. When managers from different parts of the world negotiate, they often misread signals and reach inaccurate conclusions. Managers can overcome these issues by building trust, paying attention to subtle messages, and understanding how to express their emotions. The necessity of evolving the role of the Chief Human Resource Officer (CHRO). CHROs should be empowered to think strategically about their workforce talent to provide competitive advantages for their organizations. The need for knowledge workers to think about work beyond automation. In the future, some workplace roles may be made obsolete by machines, but to continue to find new roles employees must proactively work with technology rather than against it. Change is endemic in the modern corporate setting, and employees who are continually learning are better equipped to evolve with this change. In Managers as Mentors, Chip R. Bell and Marshall Goldsmith present a mentoring guide that assists managers in taking on coaching roles to enhance the skills and abilities of associates. The authors emphasize that protégés are meant to develop into confident individuals who assume greater roles, and that the mentor/protégé connection is a partnership in which both parties gain valuable insights throughout the process. Managers as Mentors explores the full range of mentoring, from creating empathy, sharing knowledge, and effective listening to stimulating curiosity, assessing performance, and letting the protégé independently exercise newly-mastered skills. The best mentors recognize that their relationships are based on mutual interests, interdependence, and respect. The communication between mentor and protégé must be honest, straightforward, and open. Protégés learn best when they are tutored in an atmosphere of trust and acceptance. Some may bring anxiety to the relationship, and this is a learning barrier because it suppresses risk taking. The mentor must overcome this by building rapport to a level where the protégé is willing to take rational risks. Communication without judgment is essential to mentoring. Mentors should express themselves to protégés in terms of acceptance and affirmation in order to eliminate protégé defensiveness and encourage freer expression. Mentors must remember that discussions are opportunities to augment their learning, not lecture. Good mentors yield the pulpit as much as possible to allow their protégés to think for themselves. Listening is essential to mentoring. Mentors should give undivided attention to their protégés, deny distractions, and make their protégés the absolute focus of their energies. This fosters greater understanding by ensuring that communication between the two parties becomes the foundation of intellectual linkage. A certain level of dependency is unavoidable in the mentor/protégé relationship, but it can be harmful if permitted to become too influential. To avoid hindering growth and development, alternative routes to learning must be explored. In The New Workforce Challenge, Andrés Hatum aims to help companies meet the challenge of absorbing the technologically savvy millennial generation into the workforce at the very time that organizations are changing faster than ever before in response to the turbulence they face worldwide. Hatum examines how firms are organizing for the future, the impact of the new organizational forms on the workplace, and the practices that firms are putting into place to attract, develop, and retain the new generation of workers. Hatum believes that the workplace and workforce need to be analyzed together in order to present the big picture. By shedding light on recent changes that organizations have gone through and likely changes to come in the future, companies can better understand how to manage the new workforce. Successful firms are adaptable and innovative; they combine changes in structure, such as decentralization, delayering, and project forms of organizing; processes, such as horizontal communication, investments in information technology, and new human resource (HR) practices; and firm boundaries, such as downscoping, outsourcing, and greater use of strategic alliances. Agile and virtual firms will shape the marketplace and at the same time will influence and be influenced by the new workforce. Heterogeneity and diversity characterize the new workforce and have replaced the previously homogeneous workforce. Millennials, the generation born between 1979 and 1997, value work-life integration and a flexible workplace. There are four main values that drive Millennials: multitasking, desire to integrate work and personal life, concern for society and the environment, and access to technology. Companies’ are relying less on their brands to attract and retain employees and more on their Employee Value Propositions (EVPs), which consist of the features that allow companies to promote themselves outwardly and generate loyalty internally. Millennial learning characteristics can be described with the acronym EPIC, which stands for: Experiential, Participatory, Image-rich, and Connected. On September 26th, EBSCO Publishing’s Jerry Eonta will be joining Saul Carliner, author of Informal Learning Basics, to present a webinar on informal learning. The webinar will be hosted by the Human Capital Institute. Informal learning can represent as much as 70 percent of workplace learning. During this webinar, the presenters will seek to answer the following questions: What is informal learning? What forms can it take? When can it make a difference in workplace performance and when might it actually detract from it? Should you divert resources from formal training to facilitate it? And how do you evaluate it? To participate in the webinar, just click the link below and register. One of the biggest challenges facing business today is finding, grooming, and retaining the best and the brightest hires. Many organizations choose to assign this responsibility to the human resources department, but according to Alan Weiss and Nancy MacKay, this can be a fatal error. The best organizations out there know that the war for talent must start at the top, where great leaders can assert control over the hiring process and foster top talent. 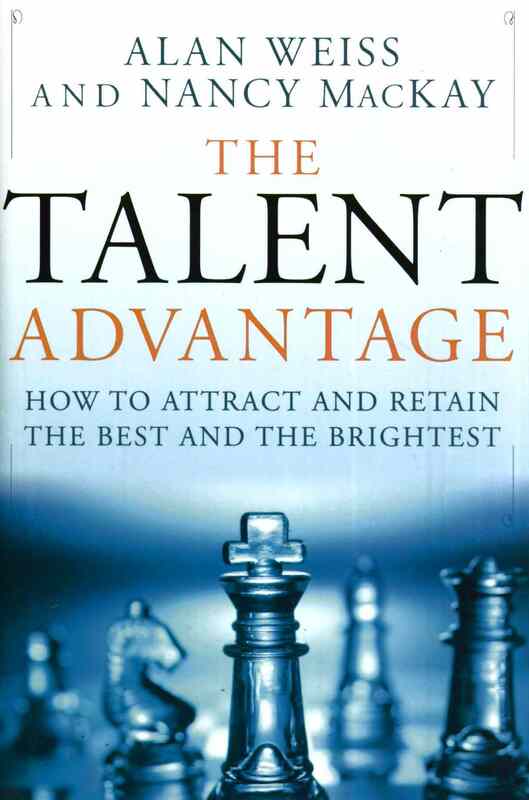 In The Talent Advantage, Weiss and MacKay draw on their years of expertise in the recruitment and retainment field to provide successful strategies, techniques, and tips that will give any company a competitive advantage in the talent wars.